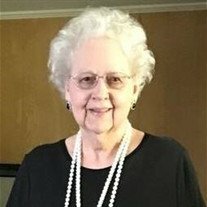 Bismarck - Maurine Mintie Smith of Bismarck, AR departed this life peacefully on November 27, 2018 in her home. She was born on December 8, 1926 in Bismarck (Lambert), AR. She was the daughter of Maney and Ella Sheets. Maurine 'Mama' was a devoted homemaker and the center of her family's faith, strength, and love. She lit up every room she entered and every life she touched. She will be forever missed by all that knew her. She is preceded in death by her parents; brothers, Kermit, Vernon, and Boyd; and sisters, Donna (Donnie) Fendley and Hazel Nelson. She is also preceded in death by her beloved grandson Zebulon Loyd Smith. After fourteen years they are now celebrating their reunion as they walk through heaven calling the Hogs together. Survivors include her husband William Loyd 'Pete' Smith; one son, Stan Smith and his wife Dallas of Hot Springs Village; two daughters, Lana Hughes of Bismarck; Gaye Smith of Little Rock; three grandsons, Zach Smith and his wife Casey; Adam Smith; Austin Smith; two granddaughters, Kori Lee and her husband Jonathan; Carrie Cannon and her husband Jacob; six great grandchildren and many nieces, nephews, and friends who loved and adored her and will cherish her memory forever. Service will be 11:00 a.m. Thursday, November 29, 2018 at Unity Missionary Baptist Church with Bro. Harold Taylor and Bro. John Payne officiating. Visitation will be 10:00 a.m. Thursday until service at the church. Interment will follow in Marcus Gardens Cemetery. Arrangements are under the care and direction of Ruggles-Wilcox Funeral Home, 517 Clay Street, Arkadelphia, AR.